In this article I’ll cover how to calculate your “outs” and provide you with some basic hand odds, plus outline some simple examples for counting outs in texas holdem. When you’re chasing a flush draw there’ll be 9 unseen cards left in the pack (or in your opponents hands). By using the simple calculation for outs (double number of cards needed multiply by 2 and subtract 1) there is a 19% chance of completing a flush on the turn. This means we have a 1/5 chance of completing our flush by the turn so we we basically need 4:1 pot-odds for a call to be profitable i.e. winning 1/5 to break even. Example of Flush Draw: The pot is $60, and player B raises it $20 on the flop, so it will cost us $20 to see the turn. Here the pot odds would be 3:1 which is negative EV for a call. We should fold. The reason we should fold here is because we’re not getting good enough pot-odds to call with +EV. If the pot cost us half as much to call, i.e. $10, then it would be a profitable call because we’d be getting 6:1 odds (we only need 4:1 odds minimum to make a +EV call). Example Calculating Outs with Pocket Pairs: We’re sat in a cash game where the blinds are $2/$5, and you’re first to act in position with 6c6d. The flop comes Ad 5h Tc, which doesn’t help your hand at all. The pot is now worth $60, and the dealer raises it $5. What should you do? The answer: fold. There are two overcards on the flop, so realistically we’re going to have to hit our set to win the hands (5% or 19:1). Unfortunately the pot-odds are only 13:1 (65:5), which means we can’t afford to call here – it would be negative expected value. 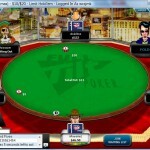 Along with folding for pot-odds however, there are also other reasons to fold. For example, because we’re out of position we don’t know what is going to happen next. Some one could re-raise the opening $5 raise for example. Thus while we should fold anyway here because of negative chip equity the fact that we’re out of position gives us other reasons to stay out of the hand. With a gutshot straight draw on the flop (e.g. 10,J,K,A) we need one specific card – in this case a Queen. With 4 Q’s in the pack, the odds of completing our straight on the turn are about 7% (13:1). This means in order to make a +EV call we need pot odds of 14:1 or better to break even. With an open-ended straight draw (e.g. 9,10,J,Q), any K or any 8 will do – this is the same as drawing to a gutshot draw except the odds are doubled i.e. 15%. We’ll need 14:1 pot-odds or better to make a profitable call here. The problem here however, is that there might be negative implied odds if we make our straight but someone else makes the nuts i.e. 10JQKA. This should make us much more sceptical of calling – either if we do have the right pot-odds.